It’s no secret that Facebook is where people spend their time. 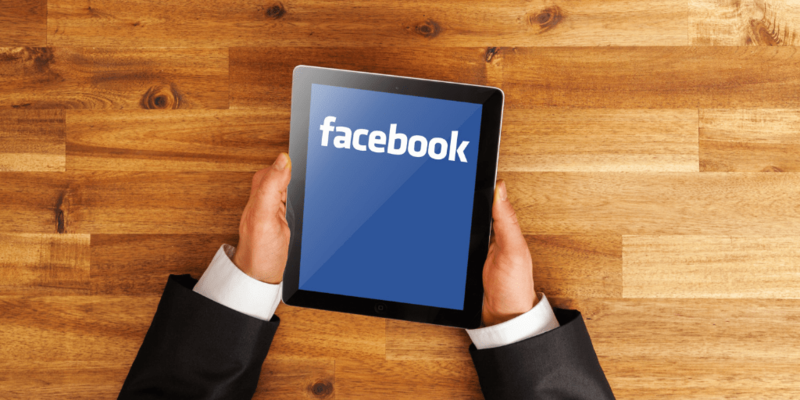 You may have a personal Facebook page, but do you have a Facebook Business Page for your firm? For each of our clients, we spend a lot of time creating and polishing their social media profiles. Today, I want to share our handy checklist for setting up and optimizing your Facebook Business Page! While your personal Facebook profile showcases you, a business page showcases your company. It’s like a profile for your firm. Anyone can follow your business page to see your updates, learn about events, and contact you. Your employees can also list your company as their employer through their profiles, bringing even more social media exposure to your business. Check out the Indigo Marketing Agency company page now and follow us here. There are a few reasons you’ll want to have a Facebook Business Page. First, it helps you reach your target audience and increase your exposure to potential clients. As of the third quarter of 2018, there were 2.27 billion active users on Facebook. (1) You won’t be able to find that kind of exposure anywhere else! Second, it builds brand loyalty. By creating a business page, you not only get your name and logo in front of people, but you have a chance to share your mission, produce content that puts your brand top-of-mind, and put a human face on your brand. Third, Facebook ads are an inexpensive and targeted way to get your company in front of the right eyes and increase lead generation and engagement. Finally, a Facebook Business Page can improve your website’s search engine optimization, or SEO. Facebook can direct traffic to your website and blog, and your posts, links, and ads on Facebook can boost your SEO. 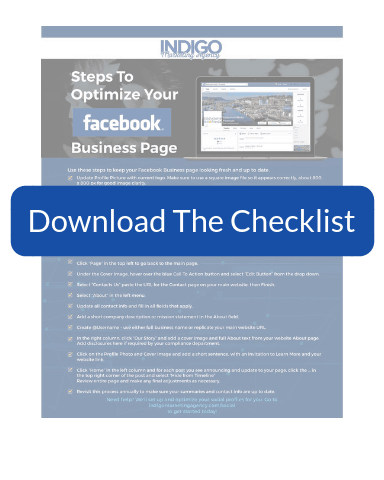 Follow the steps on the checklist below to create and build out your Facebook Business Page. If you need help, email me today at claire@indigomarketingagency.com. Want to learn more about how Facebook can help your business grow? We can set up and optimize your social profiles and create Facebook ads to generate new leads for your firm. Claire Akin runs Indigo Marketing Agency, a marketing firm serving top independent financial advisors. Claire is a former Investment Advisor Representative who holds her MBA in Marketing from the Rady School of Management at UC San Diego as well as a BA in Economics from UC Davis. It’s her goal to help specialist advisors target their ideal prospects with content marketing.